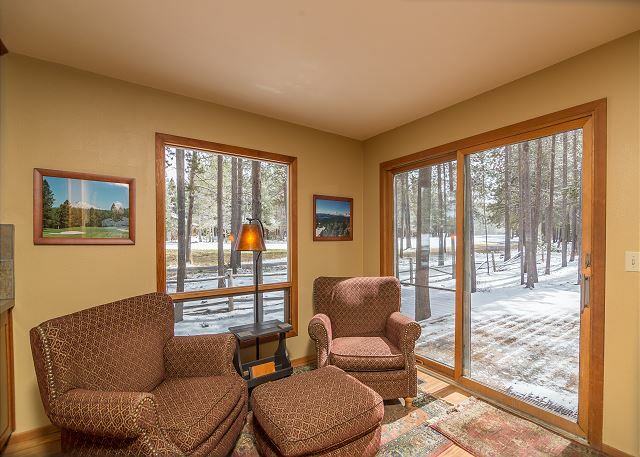 Upgrade your vacation in Sunriver when you stay in Olympic Lane #5. This 4 bedroom with loft and 2 ½ bath home has a soaring great room plan located on the Meadows Golf Course. The spacious kitchen is perfect for preparing family meals and the large living room with fireplace is perfect for creating family memories. Olympic Lane #5 boasts designer furnishings throughout the home with a 58inch Samsung 1080P Plasma TV and surround sound system with 6 speakers. 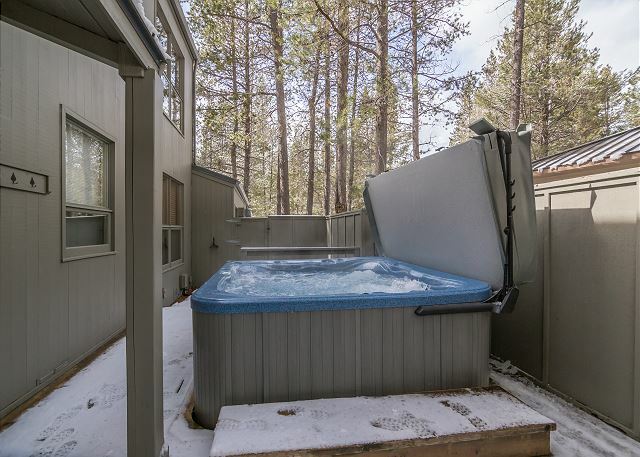 Relax in your private hot tub or take the bikes out for the day and ride Sunriver’s 30 miles of paved bike paths! You will want to bring your bathing suit and make sure you make time to go relax and have fun at SHARC Recreation & Aquatic Center. 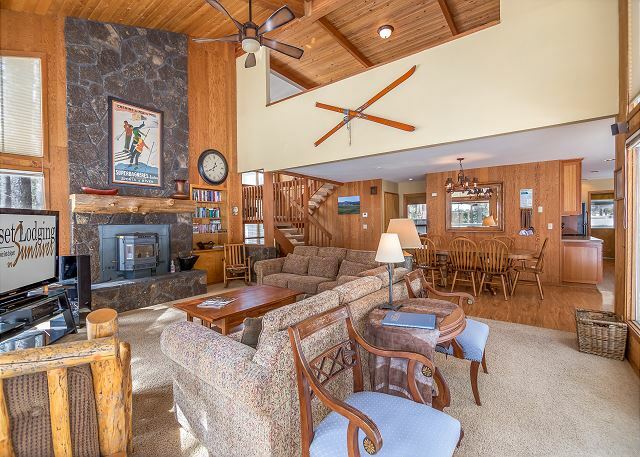 This home provides up to 8 unlimited SHARC passes, free tennis and free access to the Sunriver Marina. 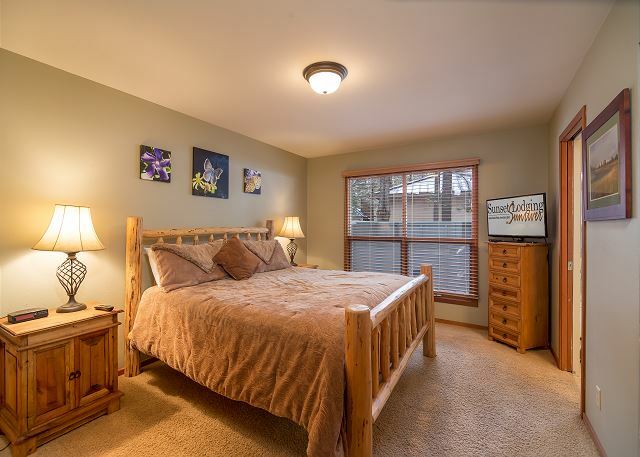 2 Kings, 1 Queen, 1 Set of Bunk & 1 Queen futon, 3TVs(1 - 58inch Samsung 1080P Plasma TV)/1VCR, Samsung Bluray Player, surround sound system with 6 speakers, D/W, W/D, microwave, pellet stove, close to mall and lodge, soaring great room plan on the Meadows golf course, spacious kitchen, designer furnishings throughout, 8 Person HOT TUB, 2 levels, gas BBQ, double car garage, 7 bikes, 2367 sq ft., 8 Unlimited SHARC passes. 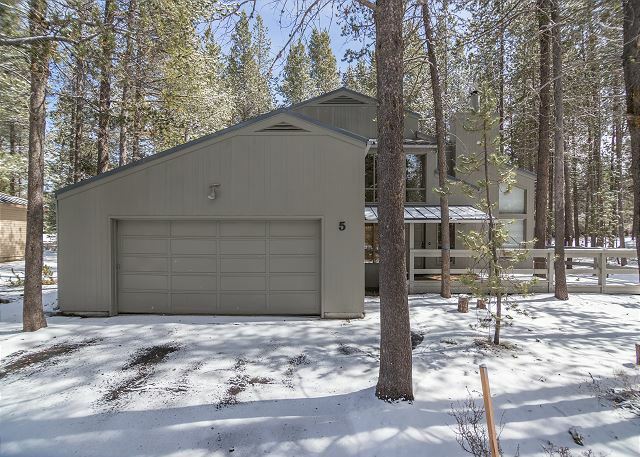 If you would like further information about this Sunriver rental or our property management services please call 1-800-541-1756. The house was very nice. The common area was spacious and allowed for visiting with lots of people. The large dining room table allowed for seating large groups. The coffee maker didn't function, but was quickly replaced when we made a phone call. We enjoyed the hot tub. There were a few things that need a little TLC, a funky kitchen water faucet, a towel rack, but in general the house was well maintained. Thank You for your review, Susan! We are happy to hear that you reported a great stay at this spacious home, we would love to host you again! Lovely!! We will see you next year!!! Thank You for your 5 star Review, Janelle! See you next year! My family had a great time at this property! Thank You for the 5 star Review, Brittany! We are so glad that your family had a wonderful time! We hope to host you again! Wonderful stay in Sunriver. Good space for 10 active adults. 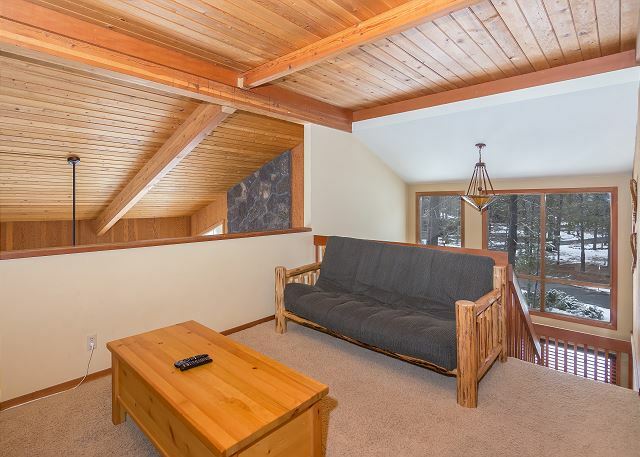 Great location, easily walk or bike to the village and SHARC. Nice having SHARC passes available. We were able to see the eclipse just right outside the backyard. Only one working adult bike however, although description indicated 5 adult bikes. Kitchen supplies could use some updates. Not enough forks, pans all scratched up, poor cooking utensils. We liked the space and location so would rent again, but, bring some of our own equipment. Ellen, thank you for your review! Thank you for joining us for the Eclipse. We're glad you enjoyed your stay. I will pass along your feedback to the owner about getting new pans and more utensils. We agree it is in a great location! We hope to have you join us soon! 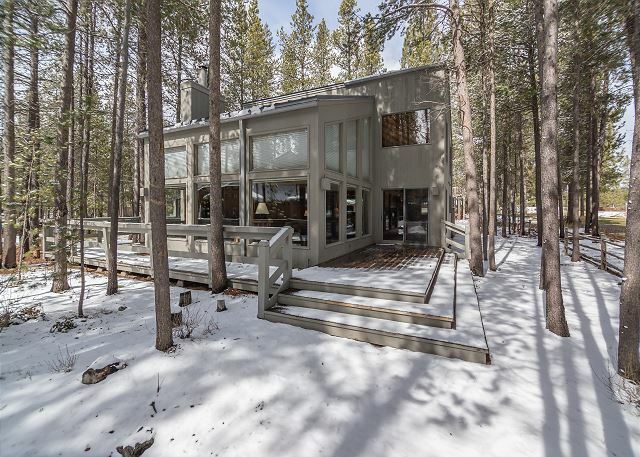 Lovely home and fantastic location in Sun River! My husband and I rented Olympic 5 on the Meadows Golf Course. We were celebrating our 60th birthday with our 3 adult children and spouses for 5 days in Sun River! This home was located in a ideal location close to the village, lodge, marina all easily accessible on bikes! Their was plenty of room for everyone! We loved sitting outside on the deck to watch the golfers and enjoyed the hot tub too! The house was very cozy and well equipped with everything you would need! There are 3 adult bikes and 2 smaller bikes! We ended up renting more adult bikes which was fine! I would say the only negative was it was really hot when we were there. The master is downstairs which kept cool but the three bedrooms upstairs were very warm. There was only 2 fans. I think if they had at least one fan per bedroom that would make a difference! We definitely would stay in this home again! I also want to mention that the property manager was wonderful to work with! Great customer service! Thank You for your review! We are happy to hear that you enjoyed all that OLYMPIC #5 has to offer, and want to thank you for the wonderful compliment to our staff - we pride ourselves in customer service and love to hear when guests appreciate our efforts! We will make sure that there are enough fans in the home for your next visit, ANYTIME you find something that may be hindering your stay, please give us a call so that we can bring more fans if needed or address any issues you may have. Come back soon! Every summer we rent a house in Sunriver and this house did not disappoint. Overall great house and perfect for the two families. 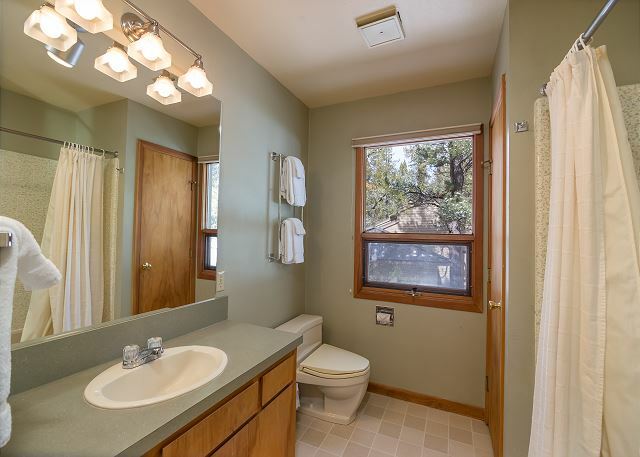 Location is close to golf course, lodge, SHARC and Village mall. Only comment I would make is the deck needs to be cleaned off once a week, hot tub needs to be cleaned once a week and about half of the bikes are not usable. But overall great house and great location. Would recommend to any potential renter. Thank you for your review Ryan! We appreciate your feedback and will be sure to check the hot tub as well as the bikes. We do service the bikes prior to summer but they are used a lot. We also do clean the hot tubs weekly, but I will check with the Hot Tub company for the home on a better clean. We also try our best to make sure the decks are cleaned and ready to go upon every arrival, however the dust here is unmanageable sometimes and the pollen makes it worse. Overall we're glad you enjoyed your stay and thanks again! We look forward to having you stay with us again! 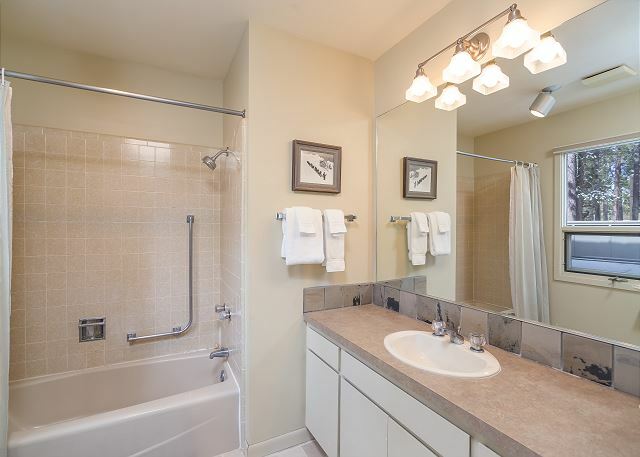 The location of the property was great - on a golf course, and a short bike ride to either the SHARC or the Mall. The layout of the house worked well for our family, with a spacious kitchen and lots of room in the house. We did cook in, and the kitchen had just the basics. Overall, it was a great house for our vacation. I would both recommend it and stay there myself again. Thank you for you review Jeffrey! We really appreciate your feedback and can't want to have you stay with us on your next vacation! The home easily accommodated 4 adults and 4 children. 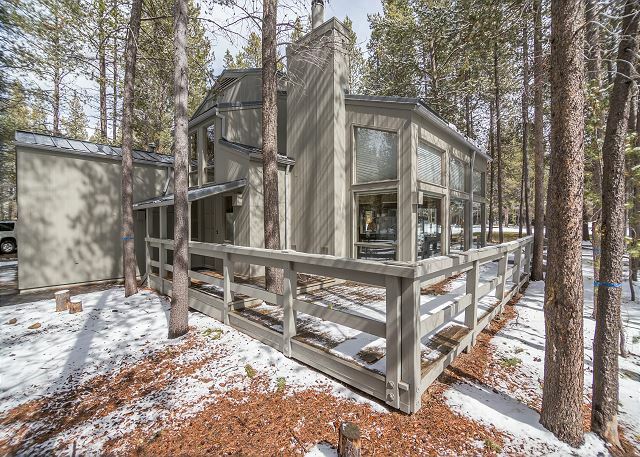 Fabulous location in Sunriver, so close to the Village, Sharc pools, river, etc. The home could use a few more kitchen utensils - whisk, large spatula, crockpot, dish sponge.. Only real issue was the condition of the bikes. Understand there could be problems at the end of the season, but surprised to find only 1 adult bike and 2 child bikes were actually useable this early in the season. Had to rent 4 bikes! Comfortable beds, furnishings. Thanks for the review Margaret. We will get our maintenance department out to look at the bikes. We are glad your enjoyed your stay and hope to see you again soon! The house was one of the best rentals we have ever had. It was comfortable for my wife and I and for my son and his family. Well supplied and close to the village. Large TVs and hot tub that worked. Passes for the Sharc Park were well used. Keyless entry was very convenient. We are looking forward to next year. Thanks for the great review Michael! We hope you and your family come visit us again soon! We stayed for a week at the end of August and found the home to be a great base for exploring Sunriver and Bend. The location can't be beat - a 10 minute stroll or bike ride into the Village, but nice and quiet right on the golf course. We were two families with 3 young children and the layout was perfect - nice and open floor plan, roomy bedrooms and large closets. The house is well stocked with everything we needed, lots of pots and pans, utensils, plenty of dishes for big family meals, and even blender, mixer, etc. There was laundry detergent, dish soap, and paper towels, and even shampoo and hand soaps, which I don't always see in rentals. Could use a few more wine glasses. The WiFi worked great. The deck is nice, although a bit worn and small. Would have liked to have some outdoor furniture for relaxing (there is a patio table and chairs). 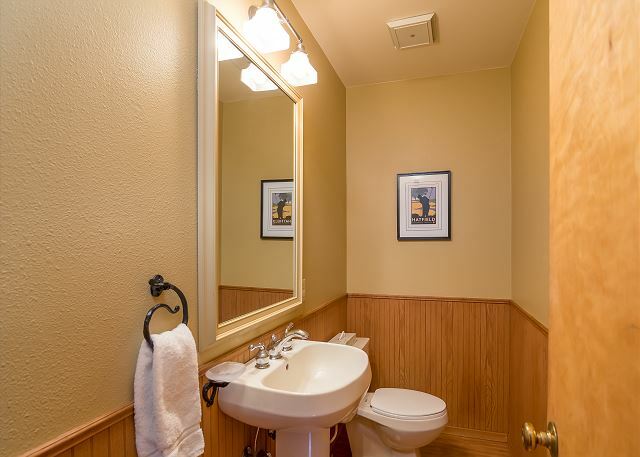 Bathrooms were dated, but clean and functional. The carpet is a bit worn and could use a good cleaning. The bikes were great, and there are helmets available as well. The rental agency was very helpful and provided a high chair and pack 'n play upon request. The SHARC passes are a really nice perk, especially with small kids since you probably aren't going to spend an entire day there. They also get you into the Sunriver Marina and tennis courts. We enjoyed the pools quite a bit. Met all of the resident deer, who are quite friendly and a big hit with the kids. The hot tub was wonderful - clean and huge and so relaxing to sit and watch the stars! All in all I would recommend the property to friends - the price was very reasonable for the size, location and accommodations. Thank you for this awesome feedback, Laura!! 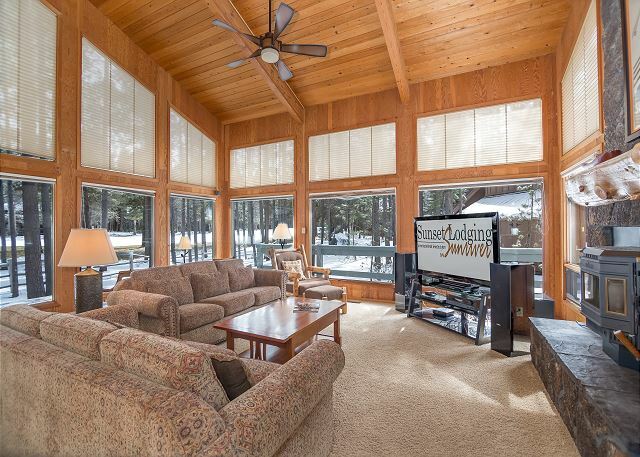 We hope you'll get back to Olympic 5 and Sunriver again soon! We spent 10 days at this property. 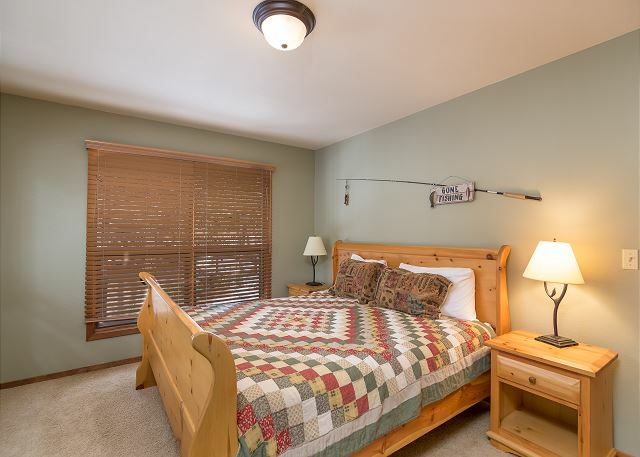 It is spacious, comfortable and within walking distance (.5 mile)from the Village. Nice view of the 13th fairway. 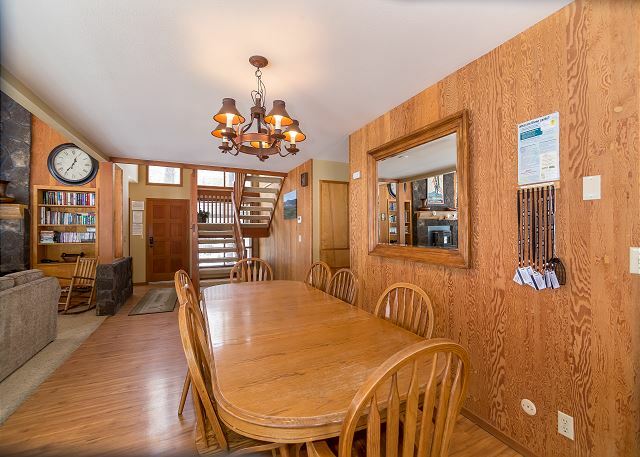 The deck is pleasant and has plenty of room for family meals. The upstairs bedrooms are overly warm on hot days; there is no AC but some fans are available. We were disappointed with the disrepair of the bicycles and bike helmets. We ended up renting bikes. The keyless access and checkout is very convenient! 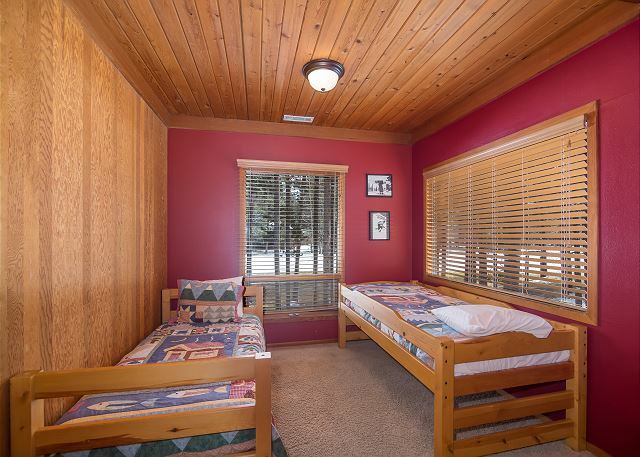 Great property in the perfect location, especially if you have kids. So close to the village and the SHARC. 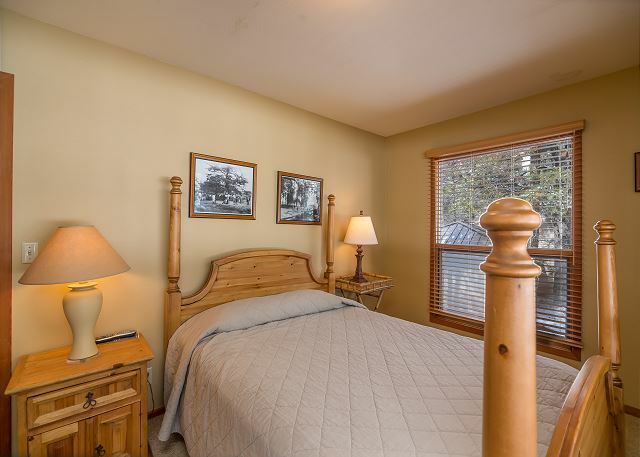 The property is well maintained with great space for a large group. The only drawback I saw was the kitchen is not very well equipped, pots and pans could use replacing. That certainly wouldn't keep me from staying there again! I highly recommend this property! Thank you for this great feedback, Kristen! We will do a complete inventory of the kitchen in the off season and supplement missing items. Thanks again for your business, we really appreciate it! You are TRULY Sunriver Summer Locals! Can't wait to see you again, Gina!!! Olympic 5 was a wonderful and relaxing home. 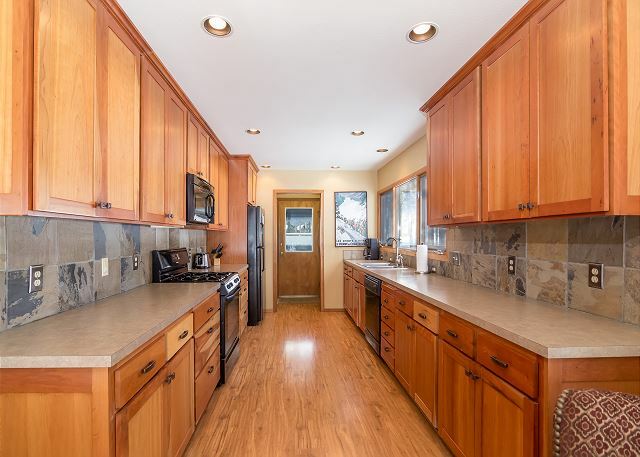 Perfect to start our mornings making breakfast and end our day with beautiful views and vaulted ceilings. We could see the deer walking around. It was a quiet spot in front of golf course. We made dinner most nights and enjoyed evening walks and the Hot tub. We used the bikes and biked all over. The Meadows and scenery was beautiful My kids and I also used them for Geocaching to keep them entertained. We used the SHARK passes and enjoyed the slides ,lazy river and pools. We drove to many national parks, Crater lake, Smith rock, High desert museum, Observatory, caves, Falls, River rafting. We biked to the store 5min. ride. Shopped and ate at the Village. Our family of 7 were very comfortable in this home. We are coming back. Absolutely wonderful! The house is beautiful. We especially liked the location (to the village & river) and watching the golfers on a lazy afternoon.